It has been on my mind for a while to put a post together - my last one is from nearly two years ago! I better get this up before the winter semester starts on Monday. I always get so inspired from all the wonderful things you are putting up on this site and cheer you on from the sidelines. These are a few things I have been making in the last months. 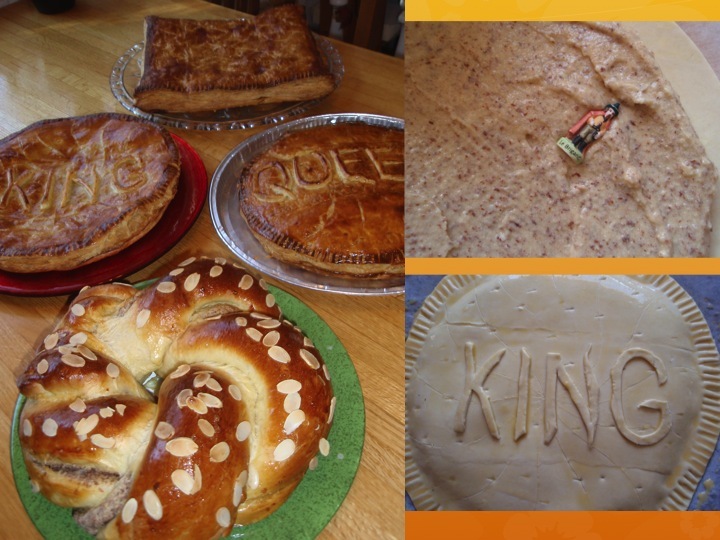 Below: Four Galettes des rois for this afternoon. We had friends over for this typical Epiphany celebration (January 6th), but since everyone was working then, we got together today for champagne, coffee, tea and galettes. 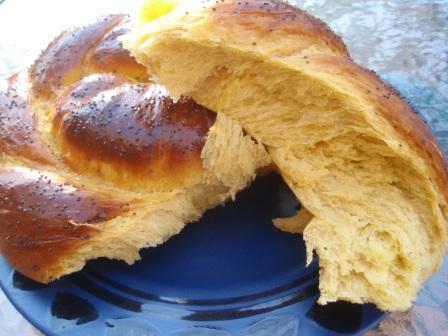 The 3 in the back are the typical French ones, the Brioche in the front is a F/Swiss crossover. All of them have the frangipane filling. Picture top right: this is the 'fève' that you bake into the cakes - whoever gets the piece with the 'fève' will be king/queen for the day! Lots of fun for everyone, not just the kids. 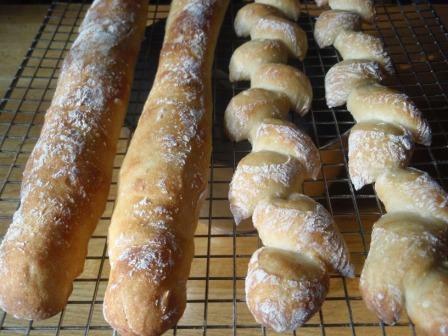 I often make David's baguettes; for me it's the best recipe out there. I have tried so many and always keep coming back to this one. 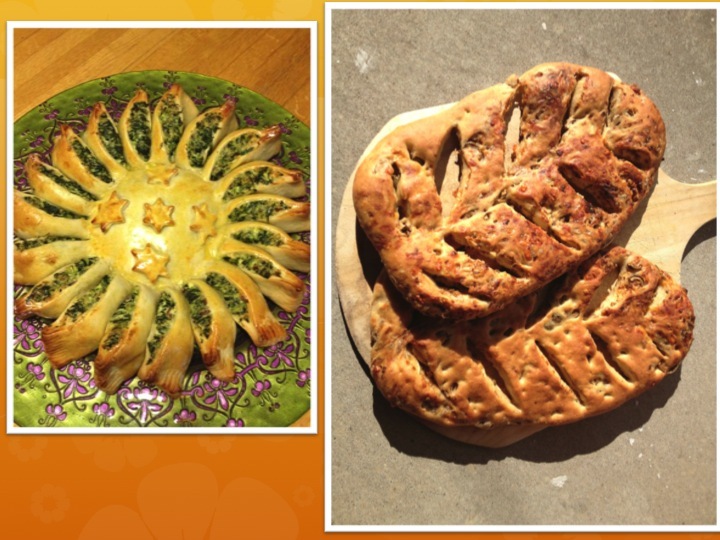 For one of the holiday parties I brought this spinach-ricotta filled sun. On the right: Walnut focaccia with Gorgonzola. 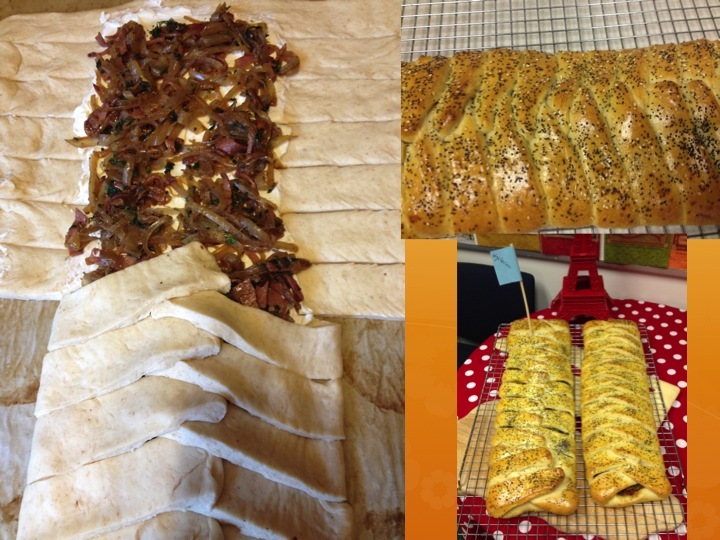 Before the semester was over in December, I brought the following stuffed breads into one of my French classes. I LOVE these crisps! An upscale deli in our area sells this type of artisan crackers (like the Raincoast crisps) for the price of gold, or nearly. 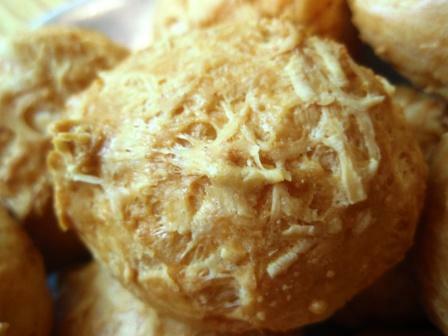 So I studied the list of ingredients and with a Google search found an excellent recipe. I have been making them at least once a month. I use mostly WW and some AP flour, and add prunes, cranberries, raisins, pecans, walnuts, almonds, pumpkin, sesame and flax seeds. 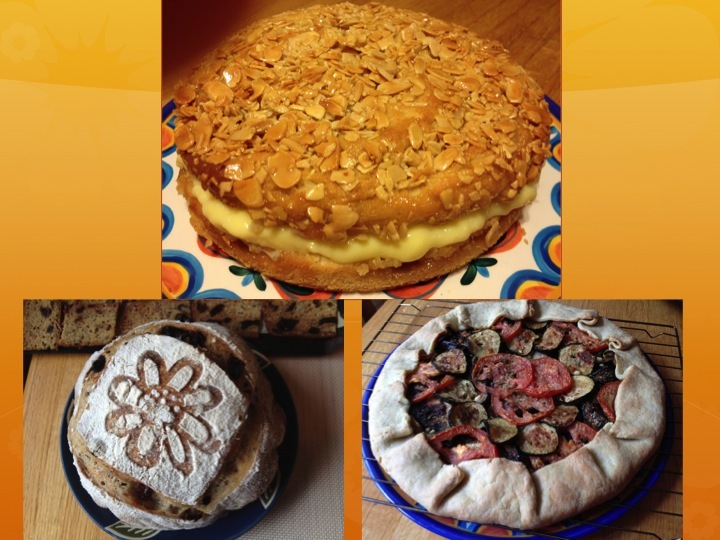 A cake for my kids, it's one of their favorites: Bienenstich (bee sting). 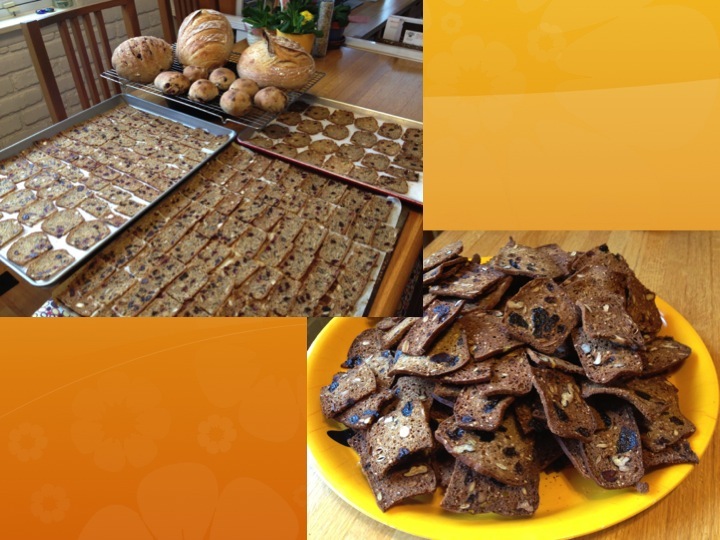 Bottom: fruit bread and vegetable tart. 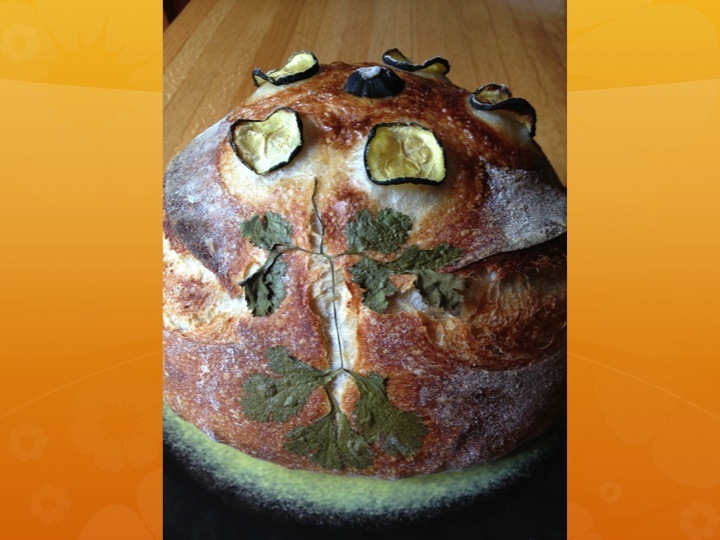 Bread experimentation with some herb and veggie decorations. I need to make macarons at least once every two months so that I don't forget how to be successful with them, since they are so finicky. Chocolate pretzels for my kids. 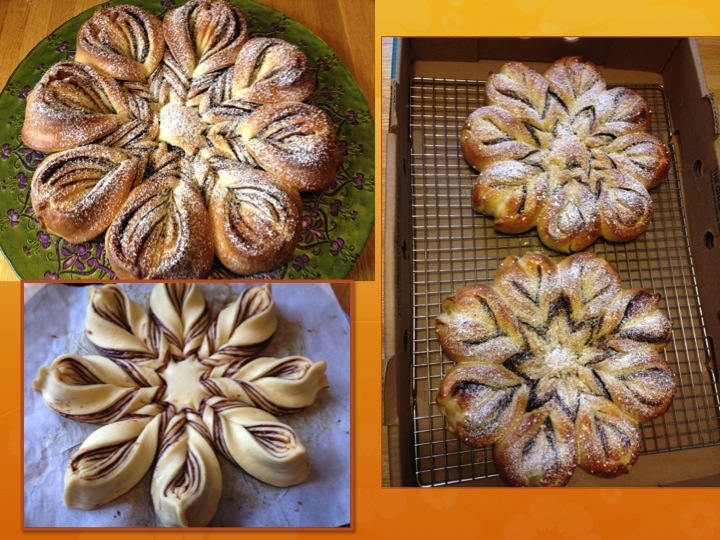 Cinnamon-sugar pull-apart breads for when our neighbors came over for coffee. A pumpkin torte for Thanksgiving. 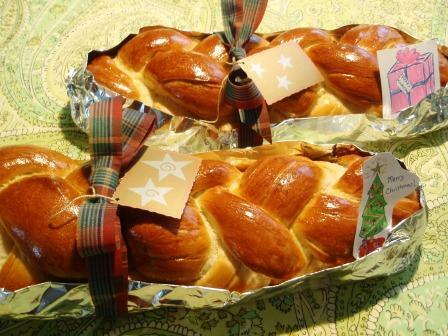 I made several Nutella brioches during the Christmas season as gifts. Each of my neighbors got one as well as several friends. An army of teddybears, from a Japanese blog. Cute but also really delicious. Very crisp. Four Swiss Zöpfe for the office assistants of my college department. Bottom left: This is the cookie plate I gave to each of our neighbors for Christmas, together with the Nutella brioche shown above. 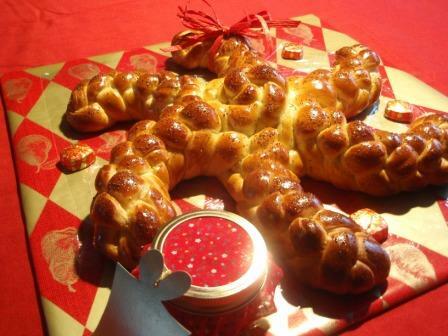 Two more gifts: A chocolate-chip Zopf and a chocolate Fougasse with an epi baguette for good décor. 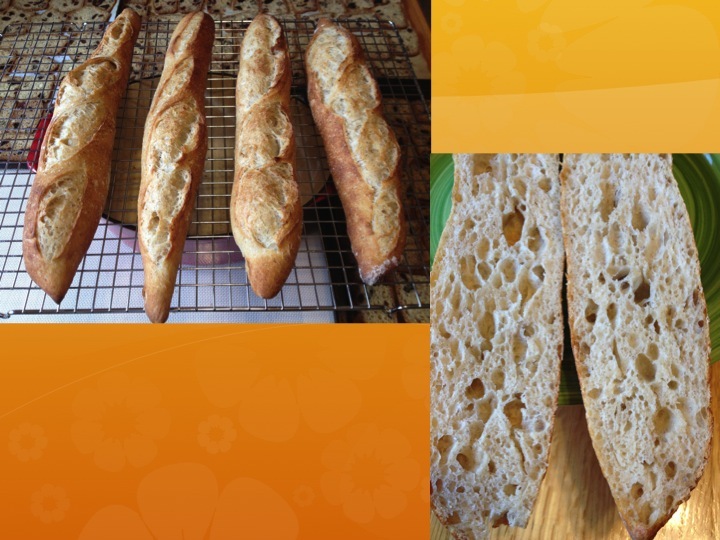 A week ago I made the Alpine Baguettes again from Dan Leader’s book “Local Breads.” This is probably my favorite bread for sandwiches to take to work (because for me, the more crust, the better). 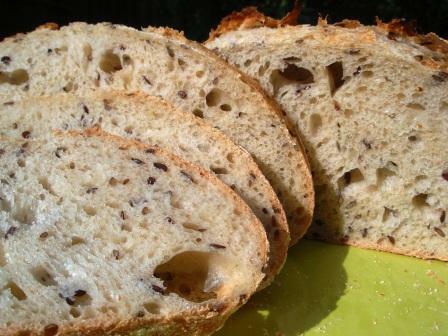 I toast them in the morning which makes them extra crunchy and brings out the nuttiness of all the seeds; a bit of mustard and then some prosciutto or spicy turkey, olives, salad, and I am in for a big treat I look forward to eating all morning. 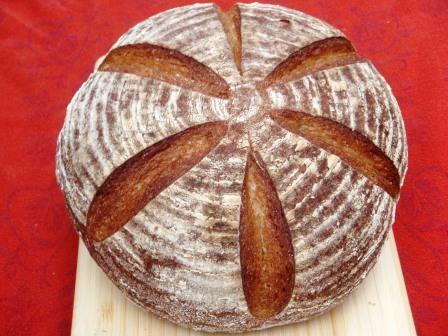 I substitute 200g of the 500g bread flour in the recipe with 150 ww and 50 rye flour. 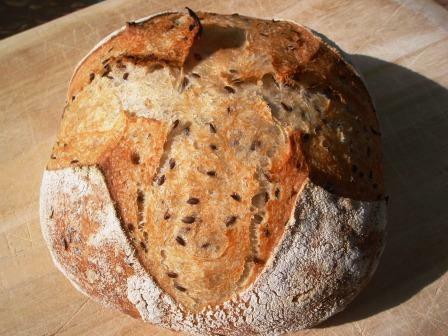 The soaker has oats, sunflower, pumpkin, flax and sesame seeds. We were invited to our Italian friends’ place on Saturday for an Easter meal and I was bringing an appetizer. I decided to make vegetable tarts. On Friday I made the puff pastry, but this time I cheated a bit. 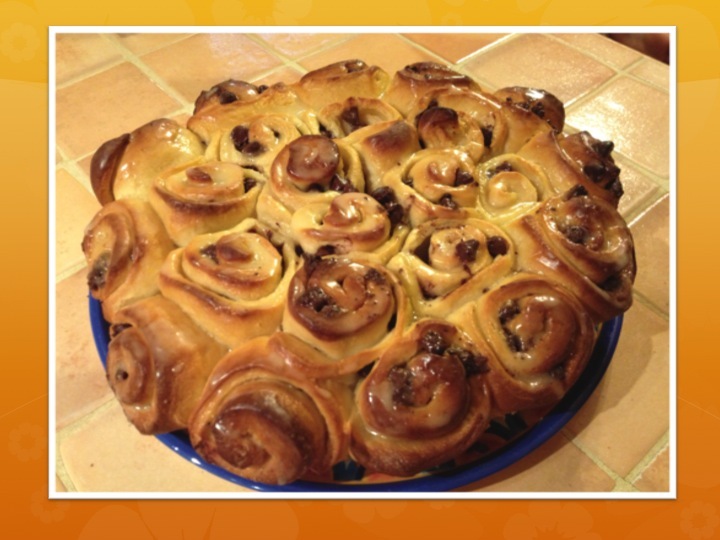 I had seen this recipe of “quick puff pastry” a while ago and bookmarked it. It’s like making a “pâte brisée” where the butter is cut-in versus folding it in like in the classic recipe. Then one proceeds with 6 turns. For these vegetable tarts, I figured it was o.k. to test this version. Did it work? They came out well and were really appreciated by everyone. I roasted 10 different vegetables: spring onions, regular onions, asparagus, bunch carrots, potatoes, cauliflower, zucchini, brussel sprouts, broccoli and butternut squash. Making this dough was super easy and there was a nice lift in the finished product, despite the shortcut. However, next time I’ll go for the classic version again, I think. 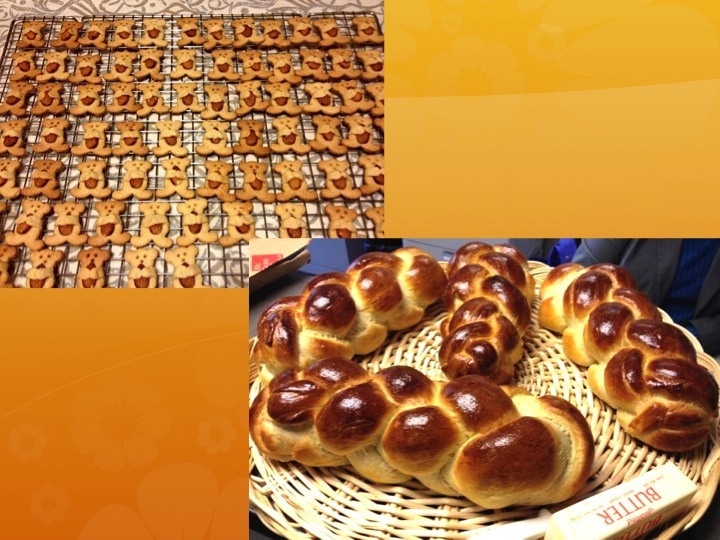 For our Easter brunch I made these Swiss milk Brötchen Murren from Pötzblog for my kids; excellent with all kinds of spreads, butter and marmalades. 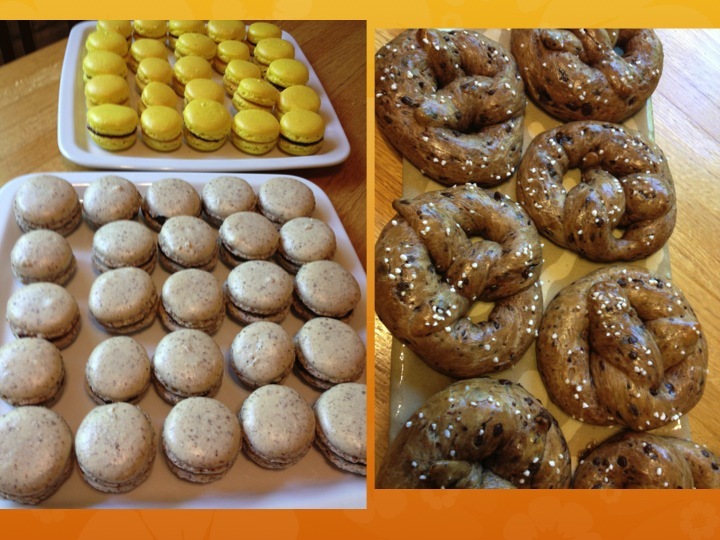 And another batch of macarons for dessert for our afternoon treat with coffee. 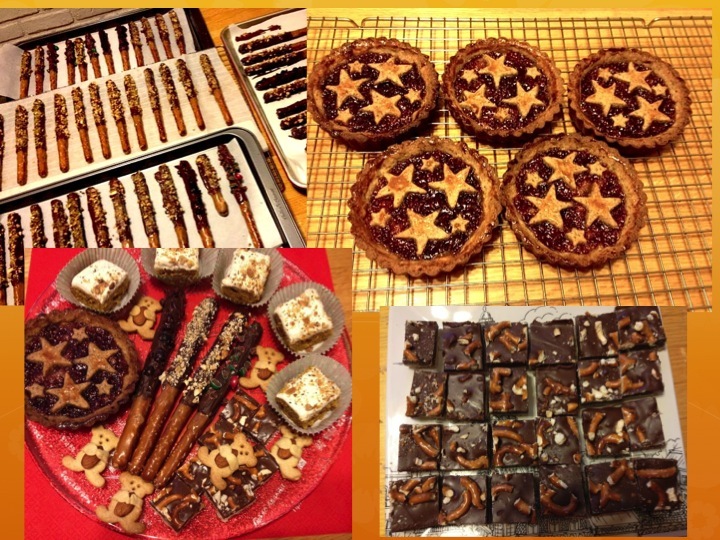 It’s been a long time since my last post, but I have not stopped baking. 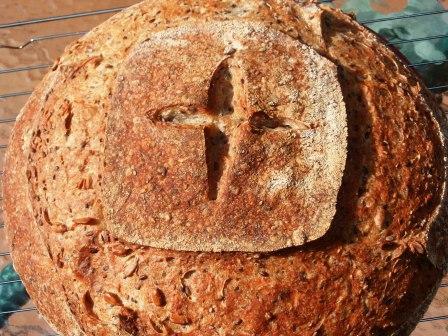 It comes and goes in waves for me, sometimes I do more and sometimes less, but I always make bread. And I look into TFL daily! Last week I was on spring break and my son was home with me because his university’s break corresponded to mine this year. 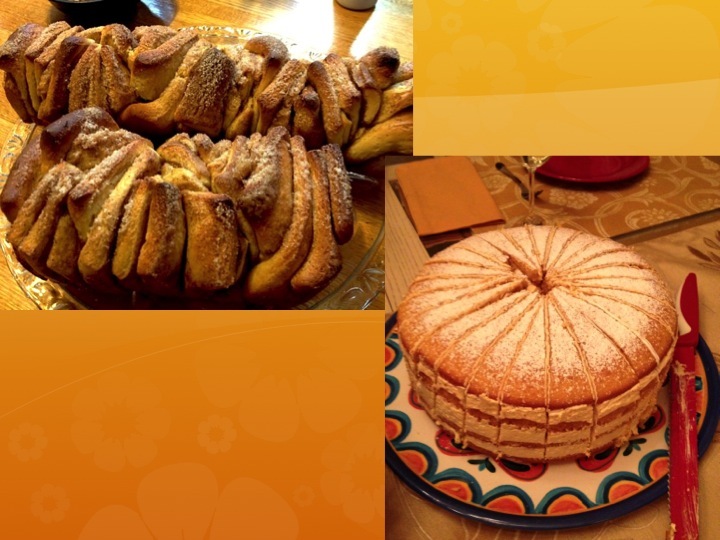 I used the opportunity to the fullest to bake for him as he is a very athletic 19-year old who can pack away tons of carbs very easily and he adores my breads (unlike my daughter who can live without them quite easily). 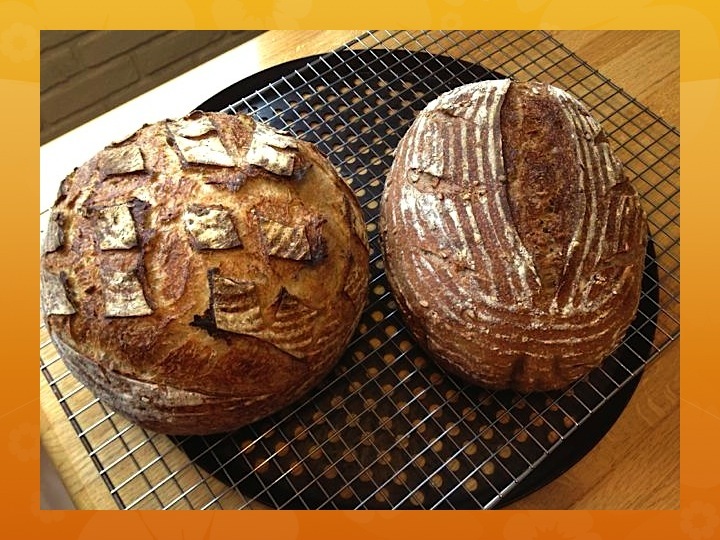 I had several doughs going on at different stages for 10 days – my kitchen felt like a laboratory at times (especially because I also made yogurt and some cheese). 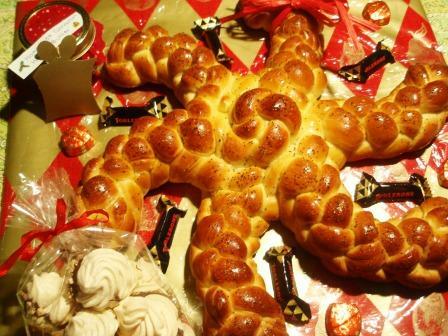 A few of these breads were given away as gifts. 1. Three different types of baguettes: the 36 hour one from Txfarmer and two recipes from the excellent German bread site Pötzblog: the Bouabsa one (which is somewhat different from the formulas I found on TFL) and a formula by Jean-Pierre Cohier (France’s best baguette in 1995 and 2006). 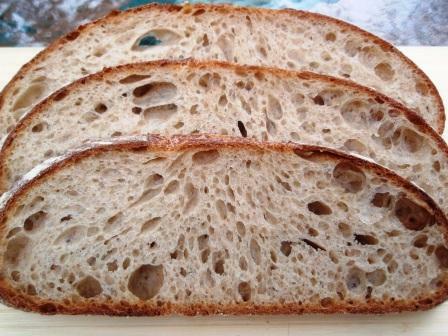 They all had excellent taste and I was semi-happy with the shapes, but am still hoping to achieve a more open crumb. 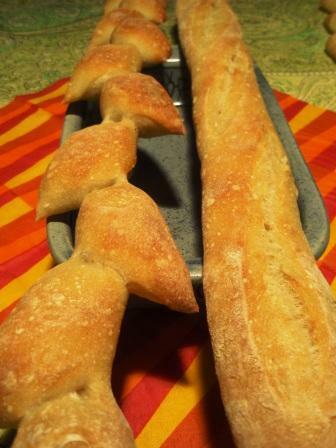 Baguettes are a challenge, for sure! 2. I bought the Tartine book already some 8 months ago and these are finally my first attempts: a white and whole-wheat boule (crumb is of the ww one). 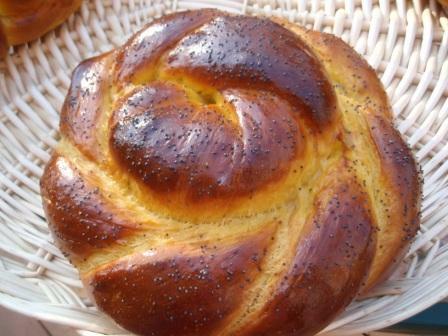 Wonderful breads. 3. Txfarmer’s sourdough croissants. I had wanted to give these a try for the longest time and finally did it. I followed her detailed instructions pretty much to the letter, paying attention to all of her advice and had no problems with the recipe (thanks Txfarmer!). I used bread flour like she recommended and the rolling of the dough went very well. I thought that all of my weight training came in handy in this effort! :) They were devoured by my kids! 4. 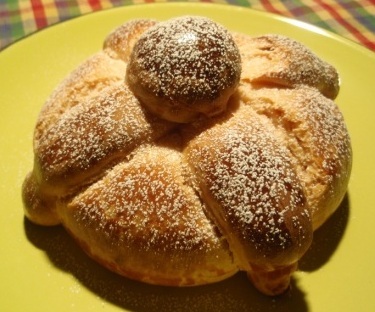 Two yeasted sweet breads filled with frangipane – absolutely delicious. I had to make these for a special event and they disappeared very quickly. Perfect with a cup of coffee or tea. I also made Chapatis for one of our dinners. 5. Second round of Tartine breads: one with with prunes and roasted hazelnuts, another one with caramelized onions and bacon pieces, and the third with olives. They were all really good. 6. 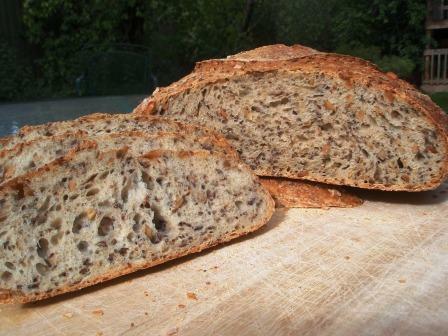 Hamelman’s Whole-wheat multi-grain in two shapes and the Potato Focaccia from the Tartine book. 7. As I said above, my daughter doesn’t like bread all that much so I made 40 of these meat pies for her school lunches. 8. Last but not least, a batch of French Macarons: the pink ones have a raspberry jam filling and the orange ones a mango and passionfruit infused ganache (my favorite). 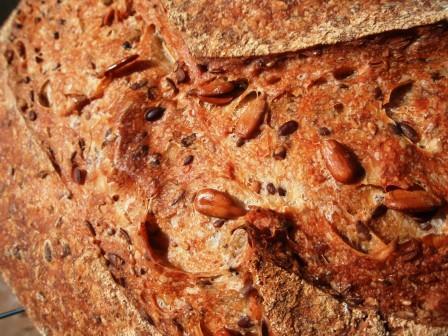 It was fun to be so immersed in dough and batters for an entire week. These are the gifts we distributed yesterday and today. Along with the breads, I included some home-made honey-cinnamon-butter and meringues dipped in chocolate-and-toasted-hazelnuts. This is Luna, our cat. 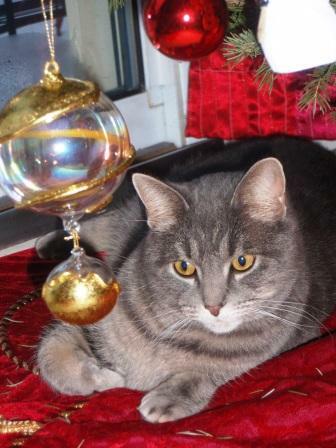 She has abandoned all of her favorite spots in the house and is pretty much to be found under the Christmas tree all day long. Happy Holidays to everyone on TFL! 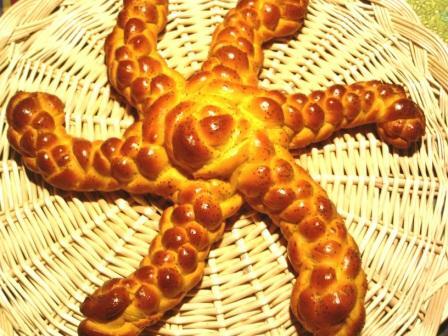 When I saw Txfarmer’s post with a sea-star pattern pumpkin challah, I knew I wanted to give it a try (thank you for the inspiration!). 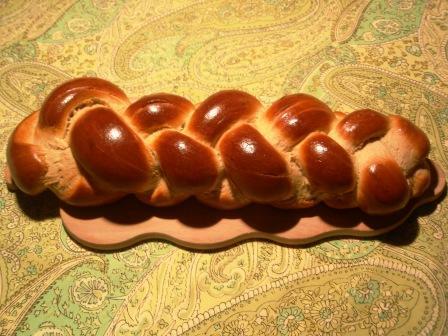 Since I was responsible to bring bread to the Thanksgiving dinner we were invited to, I thought this would be a beautiful addition to the table. 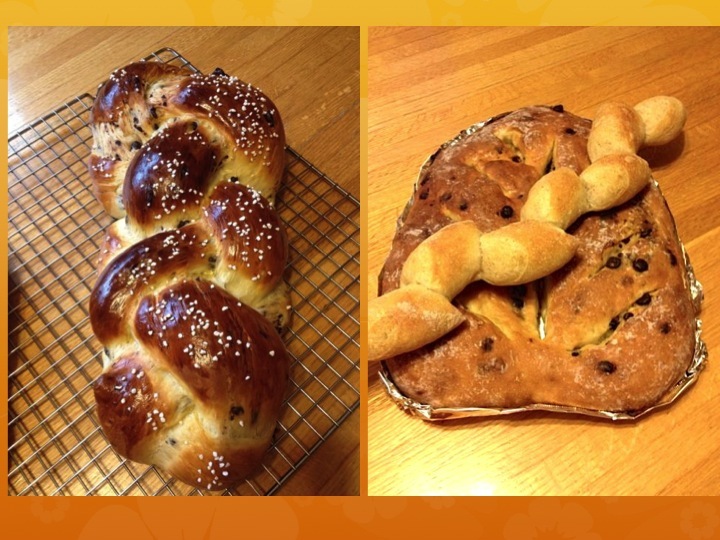 I also followed Txfarmer’s lead when it came to the recipe and used Maggie Glezer's "A Blessing of Bread” pumpkin challah one. 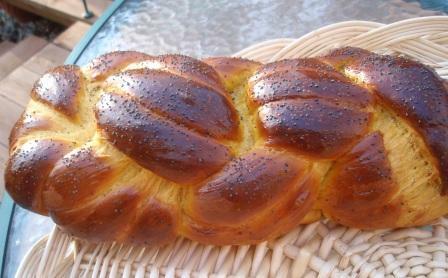 I have never made challah before, but often bake Zopf and brioches, and the dough consistency is very similar. It was a fun project and I really enjoyed it! And on top of everything it tasted really good. The deep yellow color from the pumpkin was also wonderful. 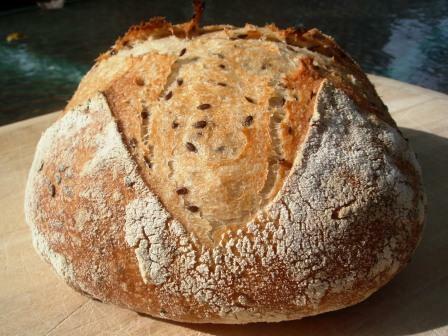 I hadn’t really paid much attention to chapter 9 in “Bread” before this project. The entire chapter is dedicated to different braiding techniques. I wanted to try a few more so yesterday, with the rest of the pumpkin puree, I made my regular Zopf recipe and substituted some of the liquid with the pumpkin. I just love the color this gives and the taste is really good as well. For this loaf I followed the Winston Knot technique (p. 306), without bringing the ends together at the end. One basically braids with 12 strands, but in groups of 3. I gave this to my neighbor to thank him for cutting my pizza stone a few days ago. 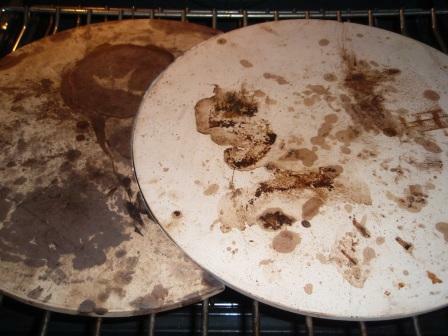 For some reason I had two pizza stones, but of course could fit only one into my oven. I bake all my round loaves on this, but could never fit long baguettes on it (thus they were baked on sheet pans). I hadn’t bought a bigger baking stone, because they are all quite a bit thicker than a regular pizza stone and thus need to be pre-heated much longer. I love that the pizza stone basically provides the same effect, but because of its relative thinness, doesn’t need to be heated up so long. My ‘can-do-it-all’ neighbor cut my second stone perfectly to complement my first one, using the surface in the oven to the maximum. I LOVE it! 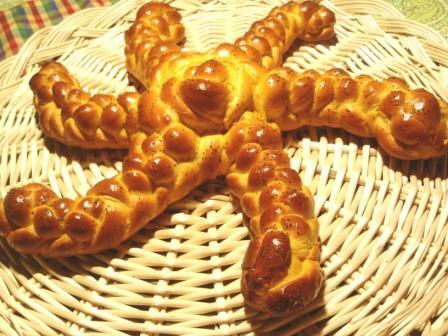 This is the very easy two-strand braid, coiled up into a rosette shape (p. 297). Mmm, those torn-away strands are so good with butter. And finally my regular four-strand braid. I was on the phone when these loaves were in the oven and forgot to cover them with aluminum foil after about 20 minutes (something I usually do), thus they got just a tad too dark. 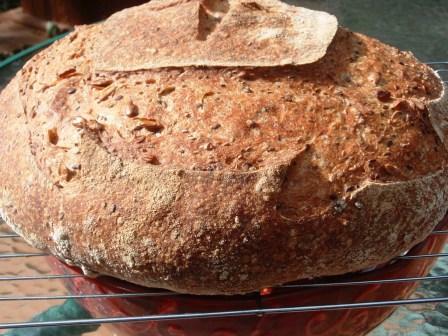 After many months, I have baked loaves from straight dough again, besides my pretty regular Zopf. I had refreshed my starters on Friday, but then the weekend presented itself in a way that I just couldn't keep up with a lengthy sourdough schedule, so in the fridge they went again, unused. 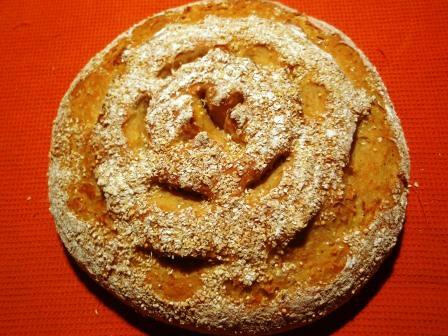 Yesterday, on Sunday, I made a "Pan de los muertos," a sweet and enriched bread traditionally baked on November 1st and 2nd in Mexico. One of our neighbors is from Mexico, but nor he nor his wife (who is American) have ever tried to bake this bread, thus to say thank you for so many little neighborly services, I made them a loaf (and one for ourselves). My yeast wasn't behaving properly and during fermentation, the dough hardly rose (I wasn't entirely sure if it was the yeast or the heavy buttery and eggy dough). However, it still turned out pretty well, and the taste was fabulous. The recipe called for orange blossom water and since I didn't have that, I added a little bit of rose syrup (something my Indian husband cannot live without). Result: the dough turned slightly red-orange (really pretty) and the flavor, also from the zest of a lemon, was simply amazing. 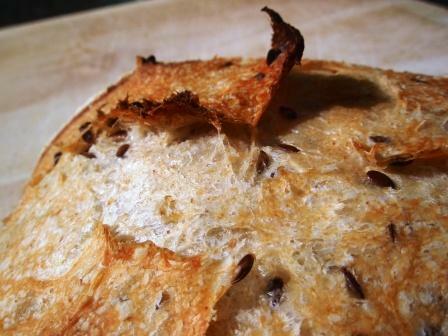 Today, while working from home, I looked through "Bread" in search of straight recipes and ended up trying the Semolina Bread with a Soaker (without the fennel seeds, p. 244) and the Five-Grain Bread (p. 238). I halved both recipes, thus producing only one loaf of each. My only changes to the recipes: I added 100g of discard sourdough starter to each (plus a little extra salt, since I increased the dough amount), thinking if nothing else, it might add some flavor. For the durum flour called for in the recipe I used chapati flour (also called atta flour) that we still have from my mother-in-law's visit this past summer. 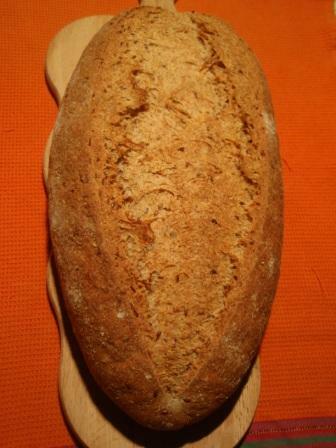 It is a type of whole wheat flour made from durum wheat, high in protein, yellow in color. I just don't know if this is the same as what is used in semolina breads (despite researching it); anyhow it turned out pretty well and is very tasty. Both of them were easy to make while grading online speaking assignments and papers. 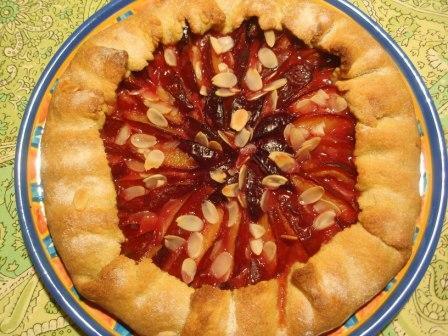 Last week I needed to use up some plums (the very last of the season) and baked this rustic tart. I just love these fruit tarts, so quickly made and so tasty, not too sweet, just wonderful. Now I always add 1/3 to ½ cup of corn flour to my dough (pâte brisée), recommended by my French friend Sophie - I really like the extra crunch this produces. It tasted wonderfully and I'll certainly make it again! 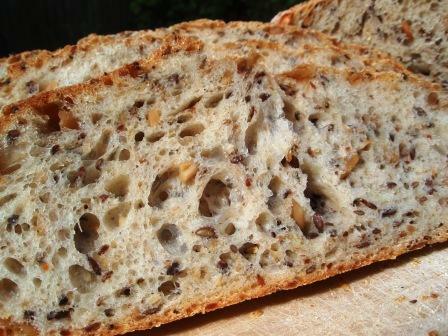 The other bread I made was the Sourdough Seed Bread (“Bread” p. 176). There had been two recent posts about this great recipe and I really wanted to try it. We absolutely LOVE it. My husband thought that my loaves should be bigger than the recent ones I made, thus I baked the entire recipe into one huge loaf, it weighed in at 1.7 kg (3.75 lbs)!! A bit of a challenge to slice... 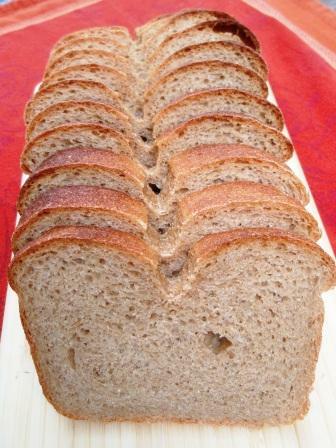 This bread will be a staple in my repertoire, no doubt! Recently friends asked me to bring an appetizer to their dinner parties. 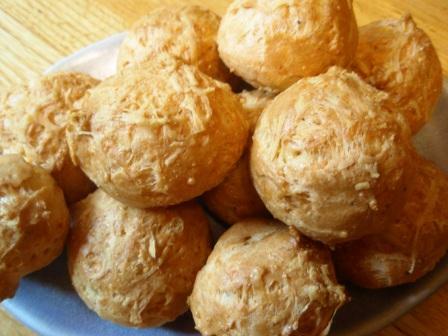 For the first one I prepared Gougères, French cheese puffs, made of a savory pâte à choux, very easy to make but I’ve heard that some people are intimidated by this type of cooked dough. I used David Lebovitz’ recipe (American pastry chef, living in Paris, with an excellent blog) with the only two changes that I upped the salt a bit and added finely chopped, fresh rosemary to the dough. The Gougères were gone in no time. 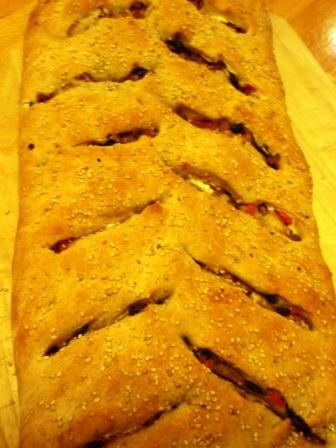 For the other party I made this stuffed Fougasse, a bread I have baked often for get-togethers, and everyone always loves it. The picture is terrible, I didn't have time anymore to snap a picture at home and at the party there was not enough light. Mix and let rise until doubled. The dough needs to be quite moist. In the meantime, caramelize one big, chopped onion in a little olive oil. Add salt and pepper. Sauté a small zucchini (or mushrooms, or whatever you fancy) cut into little cubes, add salt, pepper, a variety of herbs. Chop some baby tomatoes into small cubes, drain the liquid from them. Add salt and pepper. I basically just put whatever I have around – it always comes out good. 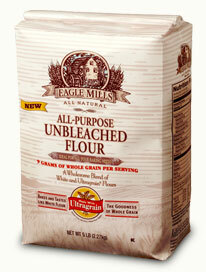 Flour your surface well and roll out the dough into a big rectangle. 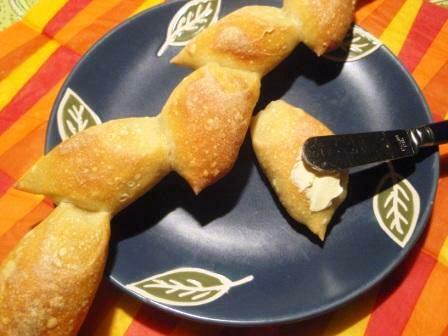 Spread about 120g cream cheese (room temperature, you can use full or reduced fat) onto it. Sprinkle whatever you have prepared as toppings evenly over the cream cheese. You may want to add a few more herbs at this point. 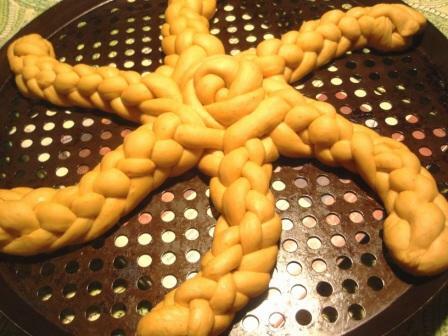 Now fold the dough into thirds, like a letter. Turn the entire rectangle over so that the back is now on top. Take scissors and make slits. Open them a little bit with your fingers. 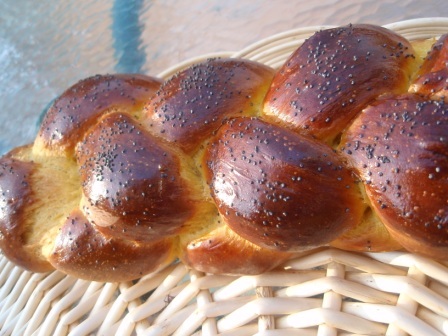 Brush the top with olive oil and sprinkle with sesame seeds. Let rest/rise for 20-30 minutes. Preheat oven to 400F and bake for about 25 min. Enjoy! I got the recipe from this website. 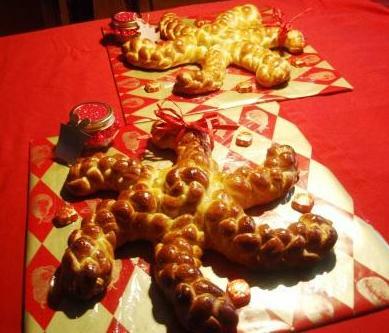 It’s in French, but if you want to make this Fougasse, I recommend that you take a look at it, since there are very good pictures explaining the filling and folding process.